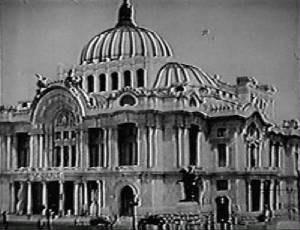 In Mexico City, an attempt is made to steal the papers of the mysterious Alfred Wyans. His secretary, Walter Dorn, is working undercover for the United States government. 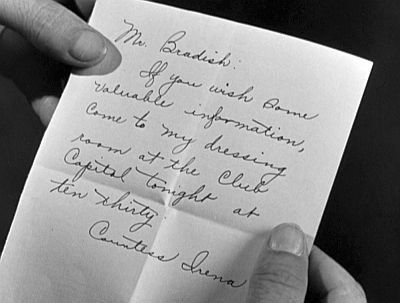 At the U.S. embassy, he begs Prentiss to send for Charlie Chan. The next day, Dorn is mysteriously shot during a luncheon party at Wyans' home. Before he dies, he manages to type the following cryptic message: "TH E$M OST." 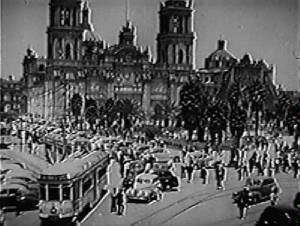 Chan arrives in Mexico City, accompanied by Number Three Son Tommy and his chauffeur and assistant Chattanooga Brown. He meets an old friend, Inspector Luis Carvero of the Mexico City police with whom he had previously worked four years earlier while assisting the British government in Honduras. Luis tells him that no gun was found at the scene of the murder and that, although the guests heard only one shot, two bullet holes were discovered. Chan tells Carvero that Wyans' papers relate to the discovery of a new, 95th element which could be used to make a bomb much more powerful than an atomic bomb. 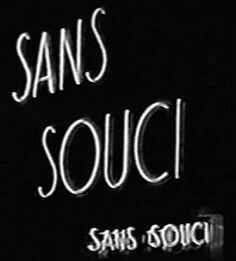 Chan suspects one of the party guests, who include Marguerite Fontan, with whom Luis is in love; Edmund Slade, a former gunrunner; Joseph Bradish, an international smuggler; the Countess Irena, a singer; and Charles Massack, a Nazi propagandist. After he questions the guests, Chan accompanies Carvero to the police lab and learns that the bullet that killed Dorn has no firing marks, indicating that it was not fired from a conventional gun. Wyans complains to the police that his typewriter has been stolen, and Chan warns him to protect his papers. Later, Chan disclosed that Marguerite had connections in Czechoslovakia, where the papers were stolen from the Allies by Wyans. While all of the suspects are at dinner, Chan and Carvero search Wyans' baggage in the basement, but are interrupted by others who have the same idea. After the suspects leave, Chan and Luis discover the missing typewriter. Wyans tells Massack that he knows how Dorn was killed, but as he tries to telephone Chan, he is shot in the same manner as Dorn. At the nightclub where Irena sings, Chan reveals that she is not nobility and that she is married to Charles Masack, who spies for several countries. Prompted by these revelations, Irena starts to reveal the secret, but she too is killed. Soon after, a similar attempt is made on the life of Charlie Chan. Chan tries to discover why a bottle of red indelible Chinese "Red Dragon" ink was found on Dorn's desk. He asks if there are any Chinese artists of note in Mexico City. Carvero mentions that there is one who frequents the many nightclubs in the city, seeking subjects to draw. Artist Iris Ling is found, who, it turns out, had visited Wyans' apartment before his murder. She tells Chan that she had sold Wyans the ink to use on his banderillas which, Chan surmises, were actually his typewriter ribbons. Chan and Carvero return to Wyans' home and retrieve the ribbon that Dorn had removed from the typewriter before he was killed. Upon inspection, it is discovered that the secret information is written on the ribbon in indelible ink. Chan clears Marguerite from suspicion when he discloses that her uncle had discovered the secret new element. He then reveals that Dorn had attempted to type the word "THERMOSTAT" as he was dying, explaining that Bradish committed the murders, using a remote control device that was disguised as a thermostat that exploded devices containing a pair of bullets that he had secretly planted on his victims. NOTES: The film's working title was Charlie Chan in Mexico. The title card reads, Charlie Chan in "The Red Dragon". Even detective sometimes fall in love...quite often with suspect in murder case. Murder is one way of discharging dangerous employee. Police always dare to tell truth. Puppy cannot fool old dog. Assistants should be seen, not heard. Good detective always look for something unusual. Hens sit often, but they lay eggs. Must repeat old police slogan: "Unusual thing always very good clue." Nothing ever entirely disappear - something always remain. Like Chinese army, Chinese ink cannot be wiped out. There is old saying: "Mother know best." (Tommy: "How about looking for something unusual, Pop?") You always provide usual noise. (Tommy: [regarding the typed "TH E$M OST"clue] "It still doesn't make sense, Pop.") It make sense if you use sense. Monogram has entered the atomic bomb pix race with a stock detective trifle involving the vet Asiatic sleuth Charlie Chan. Pic isn't a serious threat, the yarn being a draggy, obvious whodunit that will suit only nabe support. Story involves attempts to steal a scientist's plans for an atomic bomb, with various mysterious characters gathered in Mexico City to lift the loot. One by one the assorted grifters are shot, with killer or weapon mysteriously absent. Chan finally discovers that the shots are fired by remote control from a launching device, and nabs the murderer, while ending the threat to the precious formula. A cosmopolitan cast goes through the motions. Sidney Toler enacting Chan in his usually placid way; Fortunio Bonanova playing a Mexican inspector; Benson Fong, Chan's irrepressible son, and Willie Best, the comic relief as servant. Marjorie Hoshelle, as a nitery singer-suspect, handles a song well. Production budget is modest and direction so-so. 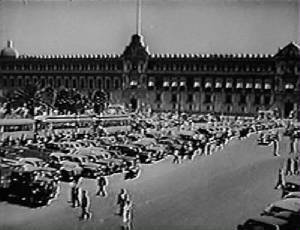 THE CITY FROM WHICH CHARLIE CHAN, SON TOMMY, AND CHATTANOOGA BROWN HAD BEGUN THEIR TRIP TO MEXICO CITY: Washington, D.C. 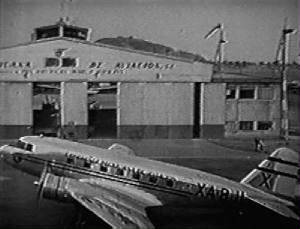 ACCORDING TO INSPECTOR CARVERO, THE AMOUNT OF TIME, UPON CHARLIE CHAN'S ARRIVAL AT THE MEXICO CITY AIRPORT, SINCE WALTER DORN HAD BEEN KILLED: "...one hour ago." 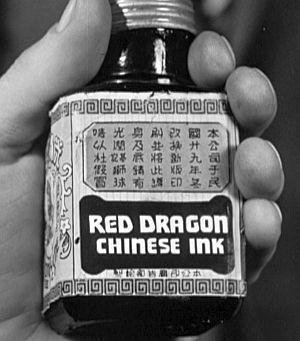 AN IMPORTANT CLUE FOUND BY TOMMY CHAN ON ALFRED WYAN'S DESK: A bottle of "Red Dragon Chinese Ink"
TOMMY CHAN'S DESCRIPTION OF RED DRAGON INK: "...rare Chinese indelible ink..."
THE "NEW" ELEMENT ALSO MENTIONED BY CHARLIE CHAN: "...unknown 95th element"
THE PREVIOUS TIME, ACCORDING TO CHARLIE CHAN, THAT HE AND LUIS CARVERO HAD WORKED TOGETHER: "Four years ago  in Honduras, when we worked together to assist British government..."
ACCORDING TO ALFRED WYANS, THE TYPE OF PASSPORT HE CARRIED: "I carry a neutral passport." EDMUND SLADE'S STATED OCCUPATION: "I'm an agent. I work for a firm that sells farm machinery..."
CHARLIE CHAN'S REPLY: "You have record as gun runner... It is also known that you escape from one country because you suspected of murder." JOSEPH BRADISH'S STATED OCCUPATION: "I'm only an oil salesman." CHARLIE CHAN'S REPLY: You have record as international smuggler." COUNTESS IRENA'S STATED CURRENT JOB: "...at present I'm an entertainer at the Capitol Night Club." CHARLIE CHAN'S REPLY: "At present." ACCORDING TO CHARLIE CHAN, INFORMATION REGARDING CHARLES MASSACK: "You are supposed to be importer...quite true. You are importer of propaganda for defeated Nazis. ACCORDING TO CHARLIE CHAN, INFORMATION REGARDING MARGUERITE FONTAN: "You are listed as tourist in Mexico City." THE COUNTRY WHERE THE PAPERS IN ALFRED WYANS' POSSESSION WERE STOLEN, ACCORDING TO CHARLIE CHAN: "Czechoslovakia...where papers now in your possession were stolen from Allied government." 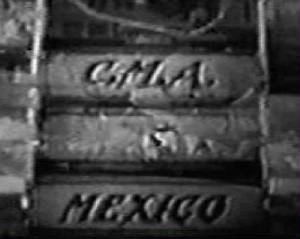 THE NAME OF THE SONG SUNG BY COUNTESS IRENA AT THE CAPITOL NIGHT CLUB: "My Heart Is Yours"
ACCORDING TO COUNTESS IRENA, THE LENGTH OF COUNTESS IRENA'S STAY THUS FAR IN MEXICO CITY: "...three months..."
ACCORDING TO INSPECTOR CORDERO, WHEN AND WHERE COUNTESS IRENA AND CHARLES MASSACK WERE MARRIED: "...six years ago (1939) in Berlin." ACCORDING TO INSPECTOR CARVERO, THE LENGTH OF TIME THAT CHINESE ARTIST IRIS LING HAD BEEN IN MEXICO CITY: "...three weeks..."
ACCORDING TO IRIS LING, WHEN SHE MET ALFRED WYANS: "...two weeks ago." ACCORDING TO IRIS LING, THE NATURE OF HER BUSINESS WITH ALFRED WYANS: "I only sold him a bottle of Chinese ink." 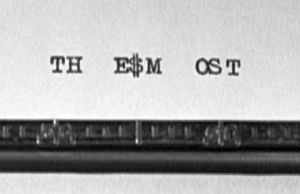 ALFRED WYANS' MESSAGE ON THE TYPEWRITER RIBBON AS READ BY THE LABORATORY CHEMIST: "Plutonium and Neptunium are elements revealed by the bombardment of Uranium, but the 95th element, which releases all energy,..."
CHARLIE CHAN'S DESCRIPTION OF JOSEPH FONTAN: "Man who discover 95th element and formula for atomic bomb..."
CHARLIE CHAN'S TRANSLATION OF WALTER DORN'S CRYPTIC MESSAGE, TYPED AS HE WAS DYING, AS REVEALED BY INSPECTOR CARVERO: "Thermostat." ACCORDING TO INSPECTOR CARVERO, THE NAMES OF THE THREE SUSPECTS WHO WERE STAYING ON THE 5TH FLOOR OF THE HOTEL MIRAMAR: "Bradish, Massack, and Slade." banderillas - (Spanish) Decorated barbed darts that are thrust into the bull's neck or shoulder muscles by a banderillero in a bullfight. Tommy Chan: "Banderillas - they use them in bullfights down here." rifling marks - The distinctively unique marks produced on a bullet by its passage through a gun barrel. 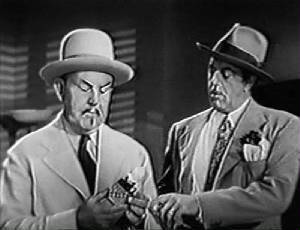 Charlie Chan: "No rifling marks on it."